Education is a fundamental right for all children. Yet for more than 60 million girls around the world, that right is denied due to war, poverty and early marriage. To improve this equation, young people everywhere are joining Nobel Peace Prize recipient Malala Yousafzai — and Adobe’s Project 1234 — in the fight against education inequality. To learn more about Malala, watch this TED Talk by her father, Pakistani educator Ziauddin Yousafzai. To learn how you, too, can be a part of the creative movement for girls’ education, read on. Every child deserves access to quality education in a safe environment. To spread this idea, Adobe’s Project 1324 recently teamed up with the Malala Fund to launch the #WithMalala Challenge — a new global digital art project expressing why girls’ secondary education matters. TEDYouth brought that creative challenge to young people at the Brooklyn Museum through a recording booth and iPads with apps like Adobe Voice, Sketch and Vibe. 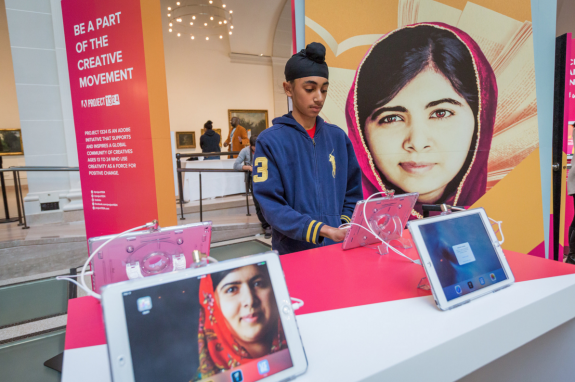 An interactive touchscreen gallery featured some of the #WithMalala submissions, giving TEDYouth attendees the chance to (literally!) see at their fingertips the empowerment that comes through education. The year-long challenge is open to all 13 to 24-year-olds who support education equality. To participate, you can submit your own creative expression — think photography, film, video, graphics, spoken word, dance, drawing or painting — here, before October 11, 2016. For more information, check out the project’s creative prompts and resources page, or follow @Project1324 on Twitter, Facebook and Instagram — as well as @Adobe on Snapchat — for all challenge updates. Thank You Malala! Keep Going! You are doing it! We are with you. You need to take part inn a contest for one of the highest quality blogs on the internet.